A large crowd of over 13,000 people enjoyed the international equestrian action and country fair in the Co Meath countryside at Tattersalls today. Amidst the warm weather with bursts of sunshine, the big crowd was treated to the ever exciting and popular Ian Stark designed cross country course and some of the biggest jumps ever seen in Ireland. Spectators got to witness the Roger Federer’s, Rory McIlroy’s and Cristiano Ronaldo’s of eventing which included the World no.1 and 3 riders amidst the largest ever field of over 366 riders. The international sporting event with 24 Olympians and world stars amongst the 366 participants is one of the most important events in the sporting calendar and this week spectators from 25 countries watched it live online up to yesterday evening. Another 15,000 people are expected to attend the finale tomorrow consisting of more world class cross country action as well as show jumping with online ticket sales up 21% so far on last year. With some competitions reaching their finale today, the ground conditions were rated as perfect and the various cross country courses proved quite challenging as expected and it’s all to play for the feature competitions which finish tomorrow with the main arena show jumping. The feature class, The Irish Field CCI3* concluded cross country with Sweden’s Ludwig Svennerstal moving up a place to first after a foot-perfect performance by his horse El Kazir SP. Irish Olympian Austin O’Connor and Kilpatrick Knight, best of the Irish, moved up from 11th place to 5th after a clear round jumping with just 0.8 of a time fault. The George Mernagh Memorial CIC3* concluded the show jumping phase with Australia’s Emma McNab having a flawless round with Fernhill Tabasco moving her up from second position to first on 21.9. 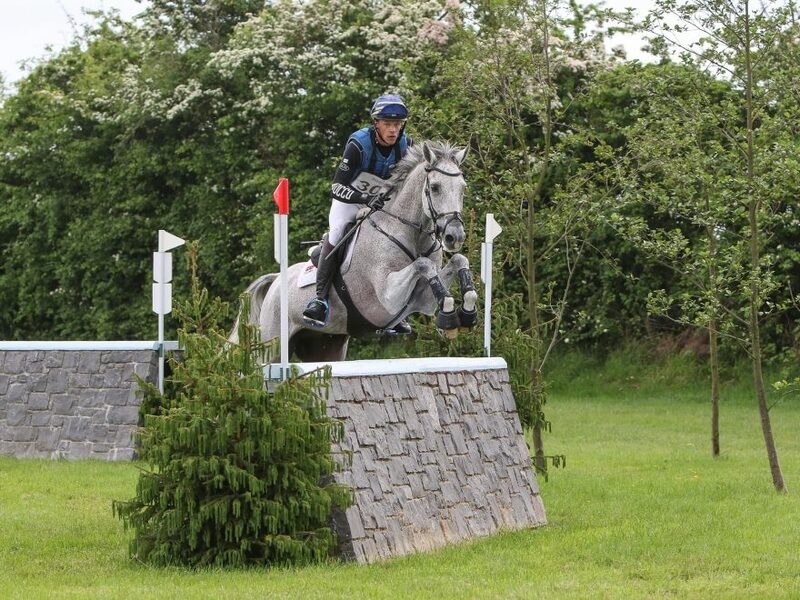 Irish Olympian Jonty Evans is hot on her tail in 2nd spot on a score of 22.8 with his mount Cooley Rorkes Drift. The cross country phase tomorrow is all to play for. The Eventing Ireland CCI2*sees New Zealander James Avery in the overnight lead with no cross country penalties today going into tomorrow’s final show jumping phase on Vitali with a score of 27.3. Best of the Irish is Jonty Evans on Dreamliner improving one position into sixth and just under three marks away at 29.7; all very tight there for tomorrow’s show jumping. The Connolly’s Red Mills CCI2* competition sees Britain’s Tom Jackson on Court Casper in the lead after a fault free round on the cross country course today and an overnight score of 25.7. Young Galway star rider Cathal Daniels is very close to the leader and improved his overall position to third with a score of 30.4 on his LEB Lias Jewel. In the Land Rover CCI1* the honours were taken by English rider Matthew Wright on The Corncrake who finished on their initial dressage score of 28.9. Best of the Irish was Steven Smith in fourth place on Donogue Big Ronnie with a very credible performance and a score of 31.2 which again was his initial dressage score with no penalties on his show jumping and cross country phases.